WASHINGTON, D.C. (BRAIN)—The U.S. Consumer Product Safety Commission is working with Nautilus Inc. to recall about 10,000 Schwinn 460 elliptical exercise machines. BOISE, ID (BRAIN)— BOB Trailers Inc. has issued a recall for its strollers with embroidered canopy logos, saying the backing patch of the canopy’s embroidered logo can detach, posing a choking hazard for babies and young children. WASHINGTON, D.C. (BRAIN)—The U.S. Consumer Product Safety Commission and Health Canada, in cooperation with Trek, has issued a voluntary recall of about 27,000 FX and District bikes from the 2012 model year. The bolt that secures the seat saddle clamp to the seat post can break posing a fall hazard. CALGARY, Alberta (BRAIN)—As the manufacturer of Chariot products Thule has been notifying its customers in North America of a recall to select Chariot bicycle trailer kits. 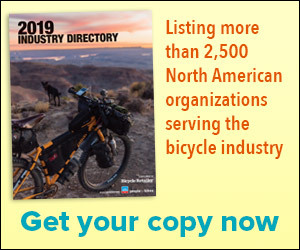 WASHINGTON, D.C. (BRAIN)—The U.S. Consumer Product Safety Commission, in cooperation with Bridgeway International, has issued a voluntary recall of about 91,000 bikes. The bicycle chain can break, causing a rider to lose control and fall. WASHINGTON, D.C. (BRAIN)—The U.S. Consumer Product Safety Commission, in cooperation with Specialized, has issued a voluntary recall of about 14,200 bicycles with Advanced Group carbon forks. Specialized was unavailable for further comment. WASHINGTON, D.C. (BRAIN)—The U.S. Consumer Product Safety Commission, in cooperation with Seattle Bike Supply, has issued a voluntary recall of about 200 Redline D640 bikes. WASHINGTON, D.C. (BRAIN)—The U.S. Consumer Product Safety Commission, in cooperation with Full Speed Ahead, has issued a voluntary recall of about 9,300 Full Speed Ahead BB30 Gossamer cranksets that are used by numerous bicycle manufacturers. The manufacturer is TH Industries of Taiwan. WASHINGTON, D.C. (BRAIN)—The U.S. Consumer Product Safety Commission, in cooperation with Giant Bicycle, have issued a voluntary recall of about 370 Anthem X 29ers from the 2011 model year. IRVINE, CA (BRAIN)—Felt Bicycles will voluntarily recall forks on select 2011 F-series model bikes. WASHINGTON, D.C. (BRAIN)—The U.S. Consumer Product Safety Commission, in cooperation with Easton Sports, has issued a voluntary recall of about 200 bikes with EC90 Zero seatposts.